Hannah Zeile as Kate Pearson. It's easy to forget sometimes that on This Is Us, you're also watching three different actors play the same character. With Kate Pearson, Chrissy Metz has proven to be a force, but teenage counterpart Hannah Zeile is not far behind. So much of the second season has taken place in the '90s timeline, allowing Zeile to prove to fans it's not just the top-billed adults who can act. The 20-year-old had a number of standout moments this season, but it's her scenes with her on-screen dad Milo Ventimiglia (Jack Pearson) that really shine. It looks like Toby and Kate are finally getting their happy ending. Through Zeile, viewers have learned more about Kate's love for music, why she stopped singing, and why she blames herself for Jack's death. Ahead of the Season 2 finale, the actress sat down with TV Insider to discuss similarities between her and her character, her hopes for Season 3, and much more. Do you ever discuss your character with the other 'Kates'? At every age, it feels like you’re watching the same person. Hannah Zeile: No, I don’t. Whenever I’m with them, we like getting to know each other personally—Chrissy’s hilarious, she just makes me laugh. But teenage Kate is a lot different than the other Kates, she has a chip on her shoulder, she’s more angsty, and has a little bit of sass. So it’s really kind of Chrissy to trust me enough to make the role my own and kind of differentiate her from the adult Kate. It’s going to be interesting to see how, throughout the seasons, she evolves into adult Kate. Really? Because at every age it feels like you’re watching the same person. That’s fantastic, that’s the goal. Sometimes people will say that I have the same mannerisms as her—my facial expressions. People on set will be freaking out, like ‘Oh my god, Chrissy does that exact expression,’ and I don’t even notice. This season was very emotionally dark at times what do you and the rest of the cast do to keep it light on set? Majority of the time, it is pretty light, but when we do those darker scenes, we definitely are in a different mindset, a different mood. Headphones are on, and everyone’s kind of taking their own space. But whenever it’s not as serious, we’re totally joking around or taking selfies or just having a good time. Is there any part of you that relates to Kate, do you have a similar love for music as her? I definitely have always been passionate about singing–I guess it is kind of a similarity in the sense that I was so stage shy about singing. For acting, it was different, but for some reason I felt really nervous to sing in front of people and I never wanted to, and that’s kind of how Kate is. She’s so insecure in herself. But playing this role has totally changed my confidence with it because now I have the opportunity to sing and I’m blessed that I do. Also, she has two brothers and I have three brothers. I grew up in a home with boys where I’m the only girl, so you’re kind of treated like the princess. Bruce Springsteen or Alanis Morissette? I have to say Alanis Morissette. I totally was excited when they wrote this into Kate’s storyline. I did an interview a long time ago and they said, ‘Who would Kate be into if she listened to music?’ And I said hopefully Alanis Morissette, that’d be super cool. I grew up listening to her, we had her CD in the car so every day on the way to school I’d be [singing “You Oughta Know”]. So when I found out that it was written into the storyline, I was like, this is perfect. Obviously, the fire was a huge plot this season. What was it like filming such an intense scene? I feel wrong saying it was fun, but it was definitely an unforgettable experience. I mean we were working with real fire. I’m looking at the cameramen and they’re in full firefighter suits head to toe and it was serious. We went through all of the safety precautions and then I got to do my own stunts. Being harnessed and let down the roof, it was so cool because a lot of the emotion was heightened. The intensity of the flames, and of going down the roof—all of the stakes were really high, so it helped the performances. When it comes to surprises in the script, how much do the writers tell you ahead of time? No, we don’t really get a heads up. I get the email that the new script is in and immediately I click on it and read it. I’m usually sitting there crying and then shocked and then laughing. I’m going through all the feels just by reading the script [Laughs]. What can fans expect to see in the finale? Is there anything you can hint at that you’re excited for them to see? I can’t say much–it’s going to be Kate and Toby’s (Chris Sullivan) wedding so I think that everyone should be really excited for that. That’s obviously been a topic that’s been discussed here and there throughout the season, so now to finally see it all come to fruition is going to be really exciting. The way the writers wrote it and the concept that they have is going to be really really beautiful. Hannah Zeile as Kate, Niles Fitch as Randall, Logan Shroyer as Kevin, MIlo Ventimiglia as Jack. Clearly fans have learned that they’ve only scratched the surface when it comes to a character’s story on the show. Is there anything that we don’t know about Kate yet? I think that there’s a lot that we probably don’t know because we’re kind of just seeing glimpses. So I believe that, throughout the seasons—obviously now that Jack is confirmed dead—there’s going to be a lot of healing and a lot of change in the family. The whole family dynamic is going to be different, especially for Kate because her and Jack were so close. And now Rebecca (Mandy Moore) is the mother and father. So it’s going to be interesting to see how Kate’s life changes and how she copes. You and the rest of the cast were awarded Outstanding Performance by an Ensemble in a Drama Series at the SAG Awards. What was going through your mind? It was almost out of body. It was really exciting and surreal at the same time. I just remember I was in my chair and I’d been seeing people that I look up to, like Robert De Niro and Nicole Kidman. It feels so special because it’s your peers–it’s actors voting for actors. I just couldn’t stop smiling. 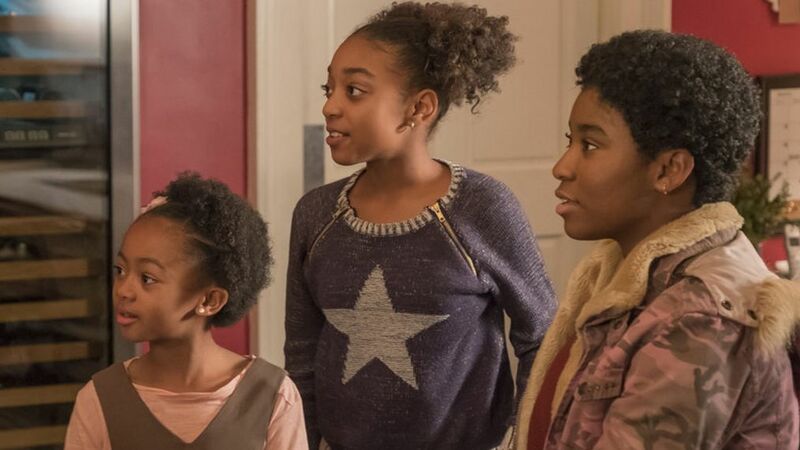 This Is Us is known for making viewers cry, do you ever cry watching? What’s been the saddest moment on the show for you? I always know what’s coming and I still cry, and then I watch it with my mom, so then I see her cry so then I probably cry a little more. So yeah, it’s a whole crying fest. The hardest to film was probably the whole version where Rebecca comes and tells Randall and I that Jack has died and how he died. That was super emotional. Mandy just always pushes me as an actress and to see her emotion was hard. We know Season 2 has wrapped but have you learned anything about Season 3 yet? I don’t know anything yet. Usually two weeks before we start filming, we’ll come in and meet with the writers and then they’ll kind of layout the plot for the season. But the writers and Dan Fogelman keep teasing me, and just keep saying, ‘Season 3,’ and I’m like, ‘What about it? I want to know!’ But if I could guess, I’m sure it’s going to be a lot of the new dynamic of the Pearson family now that Jack’s gone. Is there anything you’d like the see happen for teenage Kate that fans haven’t seen yet? I always trust in the writers, but I think it’d be cool to touch on her music career. I know that we saw she applied for Berklee and that she has this passion for singing but she’s kind of shy about it. I don’t know if because of her dad’s death that’s all going to be squashed and put aside. Or maybe she’s going to be inspired and write more of her own music. I don’t know, I’d like to see what she does with her music career. Mandy Moore as Rebecca, Hannah Zeile as Kate. Milo’s revealed that he and Mandy have a tradition of watching episodes together, who do you watch the show with? I like to watch it with my mom because she’s just super emotional anyway, so it’s like I get the extreme of every reaction to everything. So, if America thought it was a little sad, my mom’s sobbing. Who cries the easiest on set? Probably Mandy, and not in a negative way–in the most positive way ever. She’s so connected to Rebecca and she cares so much about the role and she’s so invested. She can just relate and really feels it and I think she helps me. We all push each other to get the emotion out of each other, but yeah, Mandy does a really good job with that. We see another side of Déjà in this week's episode. Who laughs the most on set? Breaking character? Maybe Niles [Fitch]. It’s funny because I don’t work with any of the adult ‘Big 3,’ obviously, because I’m in a different timeline. But yeah, sometimes Niles will find something funny and then he can’t hold it together. He’ll just try to go through the scene, but he’s smirking the whole time. So I’m just like, ‘We need to re-do,’ I’ll just start laughing. Dream This Is Us guest star? That’s so hard! I’m such a fan of so many people. I really like Margot Robbie. Maybe she could be a music teacher that inspires Kate, cause that’d be really cool. I just saw I, Tonya and she was fantastic. What TV reboot has you the most excited? I know that Roseanne is being rebooted, I’m kind of intrigued to watch it. I didn’t really watch that much of Roseanne beforehand, but I actually auditioned for a Roseanne reboot when I was 14–so five years ago. I’m curious if this is the same script. I’m kind of intrigued to see what’s going on there. Show you’d like to guest star on? Oh my gosh, I couldn’t even limit it. I would be happy to do maybe like, a crime show? I don’t know. I’m really into the crime-type shows.